In our last report on the topic we warned that while the US labor market could continue to grow modestly, it is slowing based on the latest data from the Job Openings and Labor Turnover Survey (JOLTS). We, like former Fed Chair Janet Yellen, prefer JOLTS data to measure the current state of the domestic workforce even if it is one-month delayed as it provides more color than the headline jobs number in the Employment Situation report. Job openings reached a series record high of 7.335 million this past December, up 29.4% y/y. In our last report we cautioned that job openings as a percentage of the labor force had retreated the last few months from its peak of 4.51% this past August. It still falls below that level at 4.49% as of December, but it is close enough and signals renewed and near-record hiring interest. Hires increased by 95,000 to 5.907 million from November to December, up 7.1% y/y. We had been noting how hires as a percentage of the labor force remained stagnant at around 3.5%, similar to the last economic cycle around 2004 to early 2007. The latest print for November was 3.62%, however. Still under the record high of 4.0% in January 2001, but directionally better. The quits to total separations ratio, or our “Take This Job and Shove It” indicator, registered 62.8% in December compared to the record high of 64.5% in July 2018. The number of quits has fallen for four straight months to 3.482 million in December, down 12k from November. Consequently, quits as a percentage of the labor force has rolled over and dropped the past four straight months from its post-recession high of 2.3% of the workforce in August 2018. At 2.1% as of this past December, it still bests the peak of the last US economic cycle when it was around 2.0%. We’ll continue to look to see if it drops below that 2% threshold as a warning sign of eroding worker confidence in the coming months. JOLTS data is notoriously choppy, so we’ll have to see if the reversal higher in job openings and hires was not just a one-off month since this past summer. Quits have continued lower off post-recovery highs, showing that not as many workers are choosing to take advantage of other job opportunities, but rather staying put in their current roles. Bottom line here, the labor market has slowed since this past summer. Next month’s jobs report will be important to identify how 2019 starts and if it can catch back up to August/July levels. Job openings have exceeded the number of people looking for work for 10 consecutive months as of December. Prior to last year, that never occurred as there were always more people looking for work than positions available since the series started in December 2000. The latest numbers: 7.335 million job openings compared to 6.294 million unemployed workers in December 2018. Job openings also continue to surpass the number of hires, a relatively new phenomenon that first happened in August 2014. 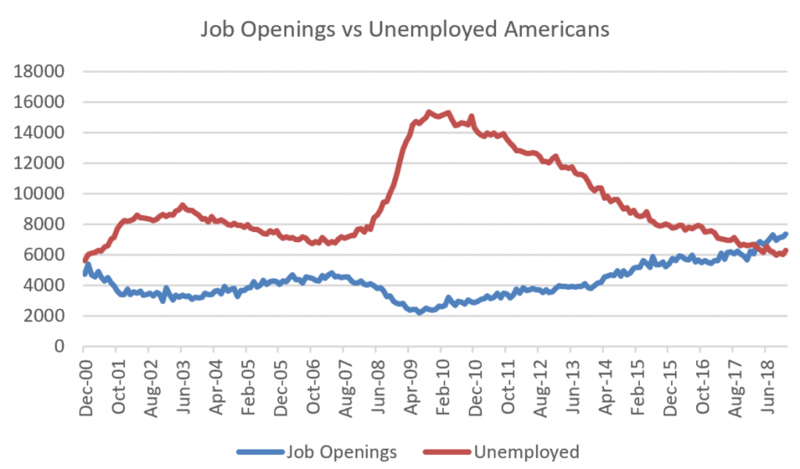 Hires have fallen short of job openings during most months since then. 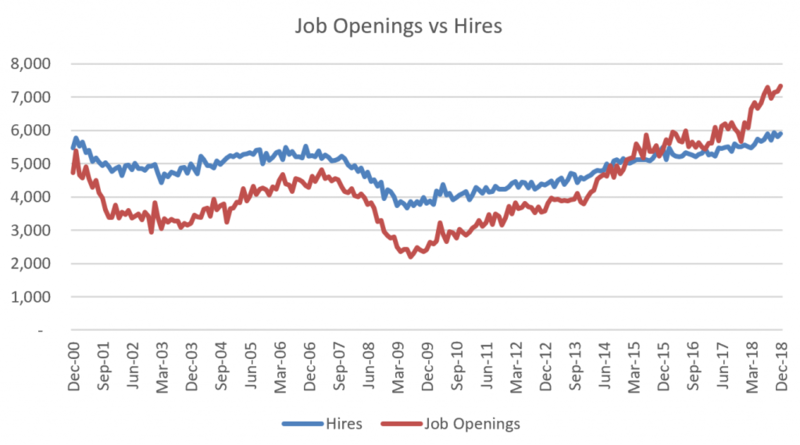 Job openings have also surpassed hires for 23 months straight. The latest numbers: 7.335 million job openings versus 5.907 million hires. The upshot: more employers looking for employees than those searching for jobs or hiring gives workers more bargaining power. The January Jobs Report showed a 3.2% y/y rise in wage growth, similar to the last few months and marking about the highest levels of the current economic recovery. Therefore, we expect strengthening wage growth to continue.